We just released another update to STELLA and iThink — Version 9.1.3. This particular release has a number of updates specific to key features. For example, if you’re a Macintosh user and rely on the data import/export functionality, you’ll definitely appreciate the updates we made to make sure the software is compatible with the latest versions of Excel for Mac. Updates to the ARRAYRANK builtin include an optional parameter to specify a secondary sort field for variables with the same value. You can now also use the ARRAYRANK builtin in a non-arrayed variable. My personal favorite in this release, though, is an enhancement we made to the Spatial Map utility. In addition to color configurations, you can now assign an image to a range of values. This really expands your ability to create interesting visual representations of spatial data. 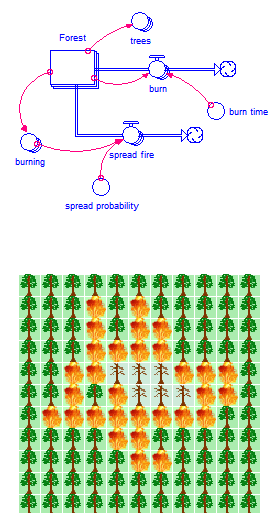 This simple model of trees burning in a forest illustrates how images can be used in a spatial map configuration. The model is set up so that initially there is one tree in the middle of the forest that is burning. All of the other trees in the forest are healthy living trees. When you run the simulation, the images in Spatial Map allow you to see the fire spreading to adjacent trees. It really adds to the visual effect of what’s happening in the model. Eventually the burning trees die out and you’re left with a forest mostly full of dead trees — now that’s a visual! If you want to learn more about Spatial Map, check out Karim Chichakly’s series on spatial modeling in iThink and STELLA . A full list of the features and fixes in Version 9.1.3 is available on our web site. If your Technical Support Contract is current, you can go ahead and download the update now from your My Software page. Hope you have as much fun with the spatial mapping as I did!